The Geyser RGB water-based fogger delivered an Olympic level performance recently at the 2015 Men’s and Women’s Artistic Gymnastics Championship, which was held in Liverpool’s Echo arena. 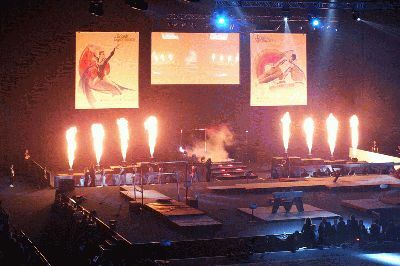 Lighting designer Stephen Jolly positioned six Geysers at strategic points in the facility for the prestigious event, which drew world and European gymnastic stars. Jolly arranged four of the Geysers around the performance platform in the center of the arena and positioned the remaining two out of sight under grills at the venue’s entrance. “As gymnasts walked in, the Geysers under the stage would fire, as if colored smoke was appearing from nowhere on the stage,” said Tim Jacques, Commercial Director of Novum AV, which supplied lighting staging, sound, pyro, video and cameras for the event. The four Geyser foggers positioned around the stage were activated at critical points during the event. For example, their colorful plumes were used to create a festive aura during the award ceremonies. With an output of 17,000 cubic feet per minute, the Geyser RGB units were able to provide a volume of fog that was more than ample enough to make a memorable impression on the audience in the spacious (11,000 capacity) arena. Some eye-popping wash lighting from CHAUVET Professional’s Q-Wash 560Z-LED added to the exciting visuals surrounding the competition. Jolly arranged eight Q-Wash 560Z-LED fixtures on either side of the raised competition stage. Spaced approximately 23 feet apart, the wash fixtures filled an important dual role during the event, serving as color washes at some points, then working with high output aerial beam effects at other points. “The client commented that this year’s event was the best yet - and we were over the moon,” he continued. “The reaction from the audience was great; people really engaged with the presentation.” Indeed, if they gave out awards for fixtures during this event, the Q-Wash 560Z-LED and Geyser RGB might well have won gold medals.